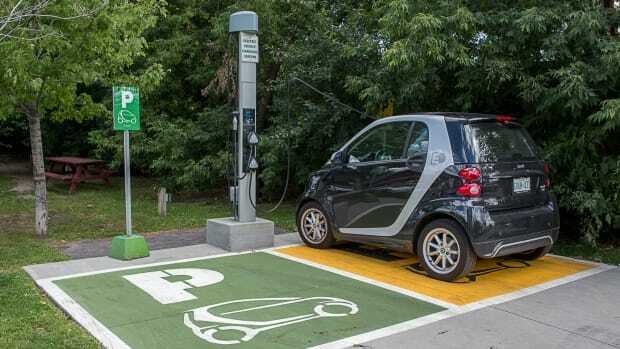 TORONTO - The Ontario government admitted Wednesday that it will fall short of meeting its deadline this Friday of creating a network of 475 electric vehicle charging stations in 250 locations across the province, and it's blaming unforeseen problems for the delay. "We know some of our partners have encountered difficulties around permitting and some of the technical aspects of having some of the chargers up and running," said Transportation Minister Steven Del Duca. Two-thirds of the network will be live on Friday with the rest of the stations expected to be up and running by fall, according to the Ministry of Transportation. "Each of our partners' individual charging stations are subject to different site conditions, land ownership, municipal permitting, electrical grid limitations and other factors which have influenced timelines," said Bob Nichols, senior media liaison officer for the Transportation Ministry, in a statement. Because the stations are located in various community centres, retail outlets and other public spaces, Del Duca said the government's public and private sector partners are facing challenges in obtaining permits but are "motivated to get it right." Cara Clairman, president and CEO of Plug'n Drive, an organization dedicated to accelerating the rollout of electric vehicles, says she isn't concerned about the delay. "It was a pretty aggressive timeline. The EV community is pretty happy with the fact that it is going to happen. It might be slightly delayed but I think overall the mood is positive," she said. Clairman said there are now more than 10,000 electric vehicles in the province and that more growth is expected. She doesn't believe the delay in the rollout of charging stations will deter anyone from purchasing electric vehicles. "It certainly does help to persuade new folks to get on board but I think since they know it is coming, I don't see it having a big impact." what you're able to achieve." Progressive Conservative transportation critic Michael Harris suggested the Liberals don't have their priorities straight when it comes to electric vehicles. "I think the focus for Kathleen Wynne was handing out $14,000 rebates to owners of Teslas, while they really should have been focusing their time and energy on ensuring that the infrastructure for electric vehicles has actually been rolled out," Harris said. Del Duca said the ministry has seen "some fairly tremendous success" despite the delays but that there have been a few challenges in building a network that ranges across the province. "We definitely want to make sure we're building a network that covers every corner of Ontario. Yes, we have some challenges and we are slightly delayed," the minister said. "We anticipate being able to provide more resources in the coming months to continue to deploy an even broader network of charging infrastructure, including in northern Ontario." Premier Wynne committed to building a charging network for electric vehicles across Ontario at the 2015 climate change talks in Paris. The $20 million in funding for the charging stations comes from Ontario's $325 million Green Investment Fund, which supports projects that fight climate change.